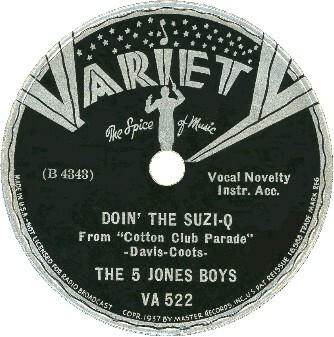 "Doin' The Suzie-Q"/"Mr. Ghost Goes To Town"
Above: Photo of The Five Jones Boys. 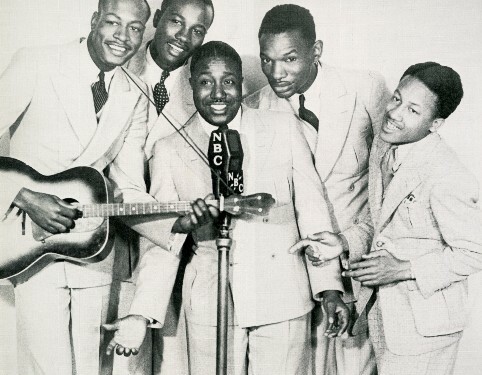 (L-R) William Bartley, Herman Wood, Charles Hopkins, Louis Wood, Jimmy Springs (who would later become the tenor lead of The Five Red Caps). In the style made famous by The Mills Brothers, this group simulated musical instruments (with the exception of one guitar). Above: Label for Variety 522. This was the first of their two releases on the Variety label, both in 1937. They performed in two movies (1936-37) and various other musical shorts. A) Click on an option below to listen to The Five Jones Boys using Streaming RealAudio. B) Click on an option below to listen to The Five Jones Boys using Downloading RealAudio.